What to do with all that Sawdust? Woodworkers and home Do-it-Yourselfers (DIY-ers) often took up woodworking as a hobby because of a deep appreciation for the craft and sometimes, for the love of the wood itself. That reverence for the wood makes woodworkers conscious of recycling of the wood they use. While offcuts (> 4” or 10 cm) can often find uses in a shop (small drawer parts, handles etc. ), shavings from handplanes or handsaws and dust from table saws, band saws, routers and other machines cause many woodworkers to wonder whether they’re using the wood to its fullest capacity. There are a lot of things the woodworker/home DIY’er can do to keep these materials from ending up in the trash or landfill. The most popular option for recycling sawdust is using it in the garden as a mulch—after all, the tree itself came from the ground, so returning its shavings and sawdust makes sense. There are a few things to remember when using shavings/sawdust for mulch in gardens and plant beds. Don’t use pressure-treated lumber as a mulch. After all, treated lumber is designed to resist decay in contact with the ground. Additionally, some forms of treated lumber are still “CCA”, or copper-chrominated-arsenic. CCA lumber was voluntarily phased out almost 15 years ago but some still remains. CCA treated lumber generally doesn’t pose a health risk to humans if used as a mulch. This is due to the fact that copper, chromium and arsenic are all bound tightly by the soil itself so these elements tend to be rather immobile. Furthermore, copper and chromium are toxic to plants at levels far below the toxicity to humans, though repeated (chronic) exposure to arsenic could become problematic. Another type of wood to avoid using in a garden or as mulch is black walnut. This wood is poisonous to horses and also kills tomato plants. However, this plant toxicity can work for the savvy homeowner—used in driveway and sidewalk cracks, black walnut sawdust acts a natural and effective herbicide and prevents unsightly weeds and grasses from growing in these areas. Most other woods make good mulch or plant bedding materials. One thing to keep in mind when using sawdust for this purpose is that sawdust consumes nitrogen as it breaks down in the soil, leaving the plants with insufficient amounts of nitrogen. This nitrogen deficiency is characterized by the yellowing of plant leaves. To alleviate this problem, always mix sawdust with materials high in nitrogen content such as manure, nitrogen fertilizers, grass clippings, coffee grounds, vegetable scraps, etc. 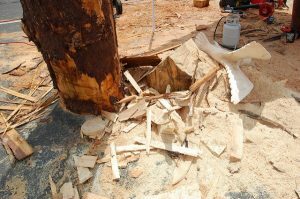 Sawdust can mix with glue to form a filler material for dents, dings or scratches in a wood project. Combine the dust with the glue and apply it to the affected area and allow it to dry completely. Finish this repair the same way as rest of the project. Don’t worry if the finish is a stain; normally, the high surface area of the sawdust would absorb much more stain than the surrounding wood and appear much darker. Since the dust is mixed with glue, which doesn’t absorb stains, the end result is that the repair looks the same as the wood itself. Using sawdust as filler material doesn’t utilize a lot of dust, though there are several bulk scale projects for sawdust and shavings. In the US, it’s illegal to discard paints in the liquid phase—using sawdust immobilizes the paint and makes it suitable for disposal. Sawdust also makes a wonderful absorbent—you can use sawdust to clean up oil spills. Cedar shavings make wonderful additions to wardrobes/closets and sawdust also makes a wonderful filling for pincushions. Shavings from fruitwood trees (apple, cherry, hickory etc.) soaked in water and used in cooking impart a wonderfully rich exotic taste to grilled meats. In short, there are plenty of options for the woodworker/DIY-er to make use of the sawdust or shavings produced when in the shop and little need to just send them to the landfill.